Call 800-488-5959 and we'll connect you to the best provider that meets your needs. Or request an appointment by submitting our contact form. 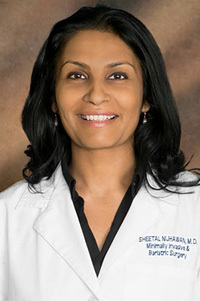 As the Medical Director of Bariatric Surgery, Dr. Nijhawan takes great pride in helping patients across the Shenango and Mahoning Valley reclaim the lives they love. Our visiting policy is flexible because we believe family and friends are integral to the physical and emotional well-being of our patients. For specific visiting questions, please check with the patient care unit's clinical staff. Any visitors coming to the hospital between 6:00 pm – 6:00 am must enter through the Emergency Care Center and stop at the Greeter’s Desk to be screened and receive a yellow visitor identification sticker. My Health Home patient portal is a secure online home for your inpatient hospital health information. Sharon Regional Medical Center is your community health care provider; a 220 licensed, acute care bed hospital with 19 satellite centers throughout the region. As a Joint Commission accredited hospital, Sharon Regional Medical Center proudly offers specialized services, including the Heart and Vascular Institute, emergency heart attack/stroke treatment, cancer care, orthopedics/sports medicine, minimally invasive surgery, emergency care, a women's center and a breast care center. The Sharon Regional School of Nursing and The Sharon Regional School of Radiography are joining together to hold an open house to meet with those interested in pursuing careers as either a Registered Nurse or as a Registered Radiology Technologist. The Open House is scheduled for Thursday, November 2 from 4 – 7 PM at the School located at 740 East State Street in Sharon. Both the School of Nursing and School of Radiography are preparing for the next incoming classes of students who will graduate in 2020 and offer flexibility and convenience and can be completed in 18 – 24 months. The School of Nursing, through an agreement with Penn State Shenango, offers students a unique opportunity to seamlessly earn both a diploma in nursing from Sharon Regional and a bachelor’s degree in nursing from the Penn State Shenango campus. An additional articulation agreement is in place with Slippery Rock University. A large majority of the students enrolled in the School of Nursing qualify for and receive financial aid and grants. Additionally, scholarships are available from a variety of sources. Prospective applicants can meet faculty, attend a presentation on the application process and pre-entrance (TEAS) test, receive information on financial assistance, and tour the facilities. Admission to the School of Nursing requires the completion of a pre-entrance exam or Test of Essential Academic Skills (TEAS) test and school application. Completed applications and passing TEAS scores are due on or before Feb 15, 2018 for consideration for the graduating class of 2020, which begins in August of 2018. Admission and TEAS test instructions are available through the Admission and Financial Aid section on the web site. Sharon Regional School of Nursing is recognized by the Accreditation Commission for Education in Nursing (ACEN) and approved by the Pennsylvania State Board of Nursing. The School of Radiography is accredited by the Joint Review Committee on Education in Radiologic Technology (JRCERT). JRCERT is recognized by the U.S. Department of Education to accredit educational programs in radiography and radiation therapy. This hospital-based certificate program prepares students to be qualified entry-level radiographers. In addition, the School of Radiography, through an agreement with Butler Community College (BC3), offers students the chance to earn their Certificate from Sharon Regional and their Associate’s Degree from BC3 which is the minimum requirement for candidates to sit for their National Registry Exam. In addition we also have an agreement with Clarion University which allows a student to earn their BS degree in a two plus two program. Individuals interested in discussing this growing field including the application process and getting a tour of the school are encouraged to attend the open house. The admission process for the School of Radiography includes a pre-entrance test call the ACCUPLACER exam which is administered through BC3. Each student needs to complete an application, have taken the pre-entrance test, and provided the program with all necessary paperwork by January 31, 2018. Those qualifying candidates will be called for an interview with the Admissions Committee, and those chosen will be a part of the graduating Class of 2020, with classes beginning in August of 2018. For more information, call 724-983-3865 or visit http://www.sharonregionalmedical.org. Sharon Regional Medical Center is your community healthcare provider; a 220 licensed, acute care bed hospital with 19 satellite centers throughout the region. As a Joint Commission accredited hospital, Sharon Regional proudly offers specialized services including the Heart and Vascular Institute, emergency heart attack/stroke treatment, cancer care, orthopedics/sports medicine, minimally invasive surgery, bariatric surgery, emergency care, a women's center, and a breast care center. For more information visit, www.sharonregionalmedical.org. Steward Health Care, the largest private hospital operator in the United States, is a physician-led health care services organization committed to providing the highest quality of care in the communities where patients live. Headquartered in Boston, Massachusetts, Steward operates 36 community hospitals nationwide that employ approximately 37,000 people and regularly receive top awards for quality and safety. The Steward network includes more than 26 urgent care centers, 42 preferred skilled nursing facilities, substantial behavioral health services, over 7,300 beds under management, and more than 1.1 million covered lives through the company’s managed care and health insurance services. Steward’s unique health care service delivery model leverages technology, innovation, and care coordination to keep patients healthier. With a culture that prioritizes agility, resourcefulness, and continuous improvement, Steward is recognized as one of the nation’s leading accountable care organizations. The Steward Health Care Network includes thousands of physicians who care for approximately 2 million patients annually. Steward Medical Group, the company’s employed physician group, provides more than 1 million patient encounters per year. The Steward Hospital Group operates hospitals in Arizona, Arkansas, Colorado, Florida, Louisiana, Massachusetts, Ohio, Pennsylvania, Texas, and Utah. Additional information is available at www.steward.org.